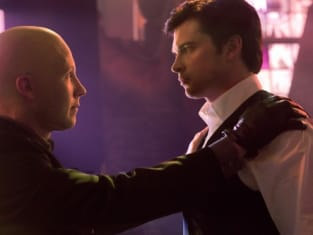 It’s not often one gets to witness a series finale as epic as that of Smallville. Going into the Finale, even I wasn’t expecting something so special. Especially with all of my worries from last week about certain plot elements that weren’t wrapped up yet. Yet what Smallville pulled off was nothing short of brilliant. It put to rest its roots in a satisfying and believable way, launching its characters into the ongoing mythology. Thinking back to watching the pilot, I'm amazed at just how much Clark (and Tom Welling as an actor) have grown. A boy who slowly gone from wanting a normal life, feeling burdened by his powers, and a bit of an outsider to a man accepting who he is, embracing his destiny, finding the love of his life, and becoming a symbol of hope and a leader. All of that came together in the finale, but not before Clark received a few more life lessons from those he cares about. It was always one of the smaller moments of the series, the bits of advice Clark would receive from those around him. But it held up the theme of the show and brought a lot of weight to some of the show’s more iconic moments. I’m glad that it was something that was touched upon even in the finale. I’ve always felt those moments were what helped defined Smallville in the beginning. The advice? There’s no reason to not embrace everything that makes Clark who he is. He is Kryptonian and he is human. By accepting both, he was able to finally, finally take flight and save the day. Lois was who I was most worried about coming into this finale because the reasons of how and why she was pushed into this predicament of cold feet didn’t feel real. I was very happy to see her realize that although all of her fears were logical, they didn’t really make much sense considering the relationship she shares with Clark. She is not a burden, she is his greatest supporter and ally. I was happy to finally see Lois cement herself in history by figuring out the army was going to nuke what they thought was a meteor and could kill millions of innocent people. In the process, she got the scoop of the century on board Air Force One. Tess is a character I could never quite figure out. For all of the redemption she sought, there was always that thin strand of darkness that seemed to creep back into her life. All we learned of her and her past, eventually finding out she was a Luthor, culminated last night into the figurative noose around her neck. In the kill or be killed world of Luthor, Tess eventually lost to Lex, but not before we finally witnessed which side she ultimately chose. As Lex stabbed her, she implanted a neurotoxin on him and erased his memory. But for all of the characters we’ve grown to love watching Smallville, last night was all about Clark Kent. Part of Clark and his destiny is Lex Luthor. I was unsure how Lex was to be handled and I was happy to see the “Smallville Way” prevail one last time. Lex was willing to wait for their epic story to begin while Clark defeated Darkseid once and for all. The finale was book-ended by Chloe reading a story to her son seven years into the future. She was reading to him a Smallville comic, the story of how Clark Kent became Superman. At the end, we saw a bow and arrow before flashing to the Daily Planet one last time. I couldn’t have asked for a better ending than those seven years in the future. We see Lois and Clark fully enmeshed in who they are and still trying to get married. We see Jimmy one last time. We hear Perry White complaining with Lois and Jimmy gauging just how bad it is. And we watch Clark run up to the roof at the first sign of trouble and rip open his shirt to see the “S” one last time while John William’s iconic score plays in the background. 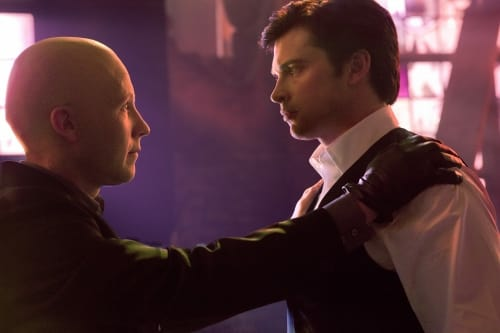 This is the scene I always imagined Smallville could end with. How fitting. To see this kind of resolution in a finale was breath taking, but to see how well the show sent me off into the future with the characters I’ve grown up with made it much more satisfying. Oliver didn’t get much of storyline. I was glad to see he ended up with Chloe and was able to overcome the darkness he’s been battling inside. 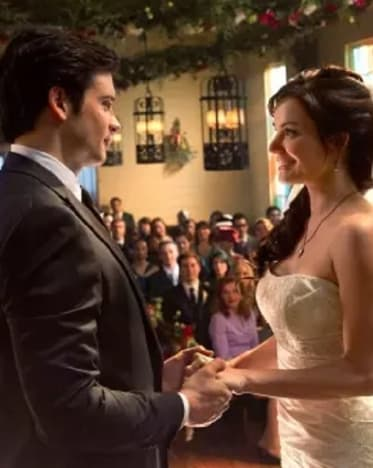 The scene when Lois entered the chapel but couldn’t find Clark was a bit heart wrenching. Then, watching as he showed up and walked her down the aisle, I had tears welling up in my eyes. It was a beautiful scene. Martha and Jonathan were much bigger parts of the finale than I thought they would be (something I’m very happy about). I loved the Smallville montages and allusions to past Superman films. Lois calling Clark “Smallville” one last time. “And now the series finale of Smallville.” It’s like a dagger to my heart.